A perfect healthy snack. 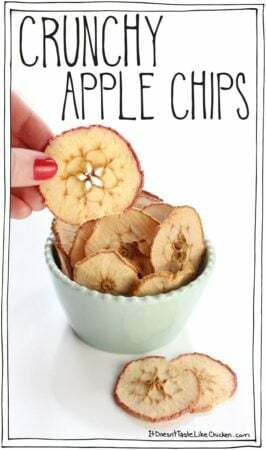 Can be made from any type apple, and can be sprinkled with cinnamon sugar, or even pumpkin pie spice. Yum! 3 - 4 small apples , any variety! Preheat your oven to 225F (110C). Line two baking sheets with parchment paper. Use a mandolin or knife to cut the apples as thinly and evenly as possible. Brush off any seeds or stems. Lay out the apple slices in a single layer so they aren't overlapping. If desired sprinkle with cinnamon or pumpkin pie spice, which you can mix with a bit of white sugar for extra sweetness if you wish. Bake for 1 1/2 to 2 1/2 hours until apple slices feel dry and leathery. Turn off the oven and crack open the oven door, and let chips cool completely in the oven to crisp up. Store them in an air-tight container for up to a week. They may lose crunchiness the longer you keep them), so I recommend snacking on them freshly made.